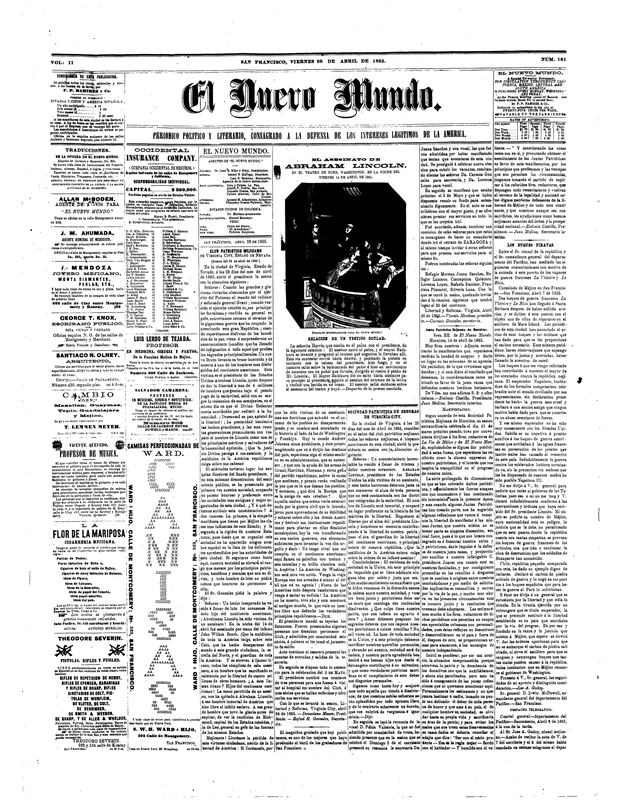 El Nuevo Mundo [The New World], was a Spanish tri-weekly newspaper dedicated to the interest of Republicanism in the Americas; copies were circulated throughout California, Mexico, Central America, and South America. In this issue, the newspaper included an illustration and an account from an eyewitness of the assassination of Lincoln in the Ford Theatre. Taking place two weeks after the assassination, El Nuevo Mundo reporters attended a Mexican Patriotic Club meeting in Virginia, Nevada. The President of the club gave a speech, expressing a thirst for justice and the fall of the Confederacy. The Society of Patriotic Women of Virginia City was also in attendance at the meeting in junction with the men of the Mexican Patriotic Club, whose president also gave a speech in front of the entire body. In a slightly altered manner, she spoke of not merely a hopeful defeat of the Confederates, but of return to union.